The meat market is a competitive place and beef is at times at a disadvantage, being pricier than say chicken or pork. What keeps the consumer coming back for beef time and again though, comes down simply to taste. However, to keep its competitive edge at the grocery store, animal scientist Dr. Keith Belk of Colorado State, asserts that there are several issues producers need to address. For instance, Dr. Belk explained that the industry is not producing enough marbling or flavor in beef to keep consumers’ buying interest. Dr. Belk believes there are multiple reasons for this lack of progress, mainly that there are not any pricing mechanisms in place that appropriately signal producers on what genetic selections they should be emphasizing. Additionally, Dr. Belk suggests that the industry should pay closer attention to the evolving expectations of consumers, specifically those of the Millennial generation. He explained that this growing demographic has concerns about their food never seen before, including the health and well-being of livestock but also the quality of care and handling during harvest. Dr. Belk insists that today’s consumer takes all aspects, especially taste, into consideration regarding their eating experience. 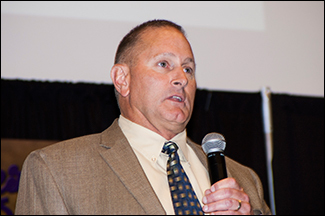 Learn more about what Dr. Belk had to say at the Beef Improvement Federation convention by clicking here. Listen to Dr. Belk talk more about taste and eating satisfaction during today’s Beef Buzz.